Local, seasonal, local, seasonal, local, seasonal. This is the mantra, repeated in every self-respecting restaurant in London. Funny isn't it, how we tend to conveniently overlook where your local Thai takeaway gets its pea aubergines from, but God help any British restaurant serving raspberries in February from the wrath of self-righteous foodies. Strange also that while we're expected to turn our noses up at Peruvian asparagus or Dominican bananas, the same rules never apply to wines and spirits. You can pair a New Zealand Riesling with your Cornish scallops, serve an Argentinian Malbec with your Scottish beef, and offer a White Russian made from a Mexican coffee-liqueur for a digestive, but try and pour it over Israeli strawberries and your name is dirt. Hey, I don't make the rules. But if you do want to buy local wines and spirits, there are options. Chapel Down wines are getting a great name in some pretty prestigious London establishments (Launceston Place had a bottle of the dessert wine "Nectar" on their list last month), Beefeater, a producer of London Dry Gin actually based in London (Kennington to be more precise) is long-established and has been turning out the same product since the 19th century. And now, the best part of 150 years since a new licence to distil gin has been granted in the capital, it finally has a rival. Sipsmith's is a brand-new company based in a secret (and modest) location in West London, making hand crafted gin and vodka in small batches. 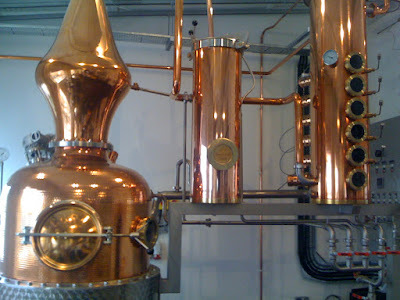 Inside what amounts to a small shed on a suburban street near Hammersmith, looking like something out of a Victorian science fiction novel, is a 10 foot high gleaming copper still called Prudence. This machine makes all of Sipsmith's gin and vodka, and huge glass bulbs hold the product ready for bottling or distribution. 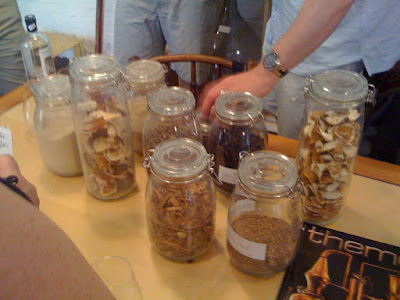 The magic all happens in this fantastically unlikely space, the five-hour distillation procedure handled by the Sipsmith's founders Sam and Fairfax, who personally taste and monitor each batch, and manually apply the botanics (including coriander seeds, lemon peel, liquorish and of course juniper berries, amongst others) to the still. A labour of love doesn't even begin to describe the two-year struggle Sam and Fairfax had to sort out the legalities and practicalities of starting the first new London distillery since the 1850s, but the results speak for themselves. The gin is fragrant and satisfying, smelling like a fresh country meadow. The vodka is similarly accomplished - clean, smooth and buttery, and silky on the throat. It's very, very good stuff. The only issue now is where to find it - being such small producers you're not about to start seeing it next to the Bombay Sapphire (or even Beefeater) in your local chain pub - but you can do worse than starting at a lovely gastropub just around the corner from the distillery called the Anglesey Arms. There are worse ways to spend an evening than with a Sipsmith's gin and tonic and a selection of items from the bar menu. While I'm on the subject of local, seasonal food, I should say something about Good Natured Fruit, who were kind enough to send me a couple of punnets of their strawberries to try earlier in the week. I have long been of the opinion that British strawberries taste a whole lot better than the great big watery ones that you see from Spain, and these were indeed very tasty, especially when washed down with sugar and cream in Wimbledon week. I'm also told they make excellent jam, although I unfortunately haven't yet got around to testing this theory despite the large pack of jam sugar (that's white sugar with added pectin to help the jam set) I received from the same people. It says something about my motivational levels in this current heat that I can't be bothered to make jam even when sent all the ingredients for free. Meh, maybe next week. So, best of British to Sam and Fairfax, good luck Andy Murray, and a long and happy summer to everyone else. Enjoy the strawberries and cherries and broad beans while you can, and do keep an eye out for some English wine - some of it's not at all bad. Just go easy on the Kahlua, OK? Reading this blog, and others like it (For We Are Legion), you may be forgiven for being under the impression that London is stuffed full of buzzy gastropubs, exciting ethnic grills and gleaming temples of gastronomy, and finding somewhere good to eat requires little to no effort at all. Sadly, although things have certainly improved in the last 10-15 years, crap restaurants are still very much a feature. I've ranted about Angus Steakhouses at length before, but there's still no excuse for them, or Bella Pasta, or All Bar One, or any of the other chain pubs and restaurants that blight our city. Once you've been to your local Slug & Lettuce and paid £8 for a horrible "vegetarian dipping platter" it becomes all too obvious why it's so difficult to get a table at the Anchor & Hope. That said, there's a part of me that realises that many gastropubs, with their fancy Mediterranean ingredients and hawing clientele, aren't for everyone. Some are more elitist than others, certainly - I've always found the Eagle on Farringdon Road to be very accessible, whereas the Swan on Fetter Lane is basically a restaurant in a pub - but surely there's room for just a normal, cosy little boozer which serves decent food for people who quite rightly consider paying £15 for bangers and mash a bit too much? Step forward, the Punch Tavern, on Fleet Street. Newly refurbished and relaunched, with a chef of refreshingly humble origins and a menu of heart-warmingly familiar British dishes, the Punch Tavern is a beautiful old building that very much deserved the attention. I was invited to lunch with a couple of other bloggers to try out their new menu, and got stuck in right away to a pint of Summer Lightning bitter and a plate of devilled chicken livers on toast. For your £4.50 you get an impressively generous mound of what is admittedly a budget cut of offal, with a marvellously rich sauce. Not very "devilled" perhaps - could have done with a bit more of the hot stuff - but no major complaints. My main course of duck roast was similarly generous for the measly £8.50 price point. A nice moist duck quarter, with creamed leeks and a good selection of roasted vegetables, my only complaint was with the soggy, greasy Yorkshire pud. I've said it before, and I'll say it again - if you can't do a proper Yorkshire pudding (and as far as I know, nobody in London can), then don't even try. There's a whole generation of people who have grown up believing a Yorkshire pud is a tiny cupcake-sized pillow of pastry, instead of the 15" square behemoths filled with gravy my gran used to serve as a starter. And it makes me sad. Anyway, that aside, I can really recommend the Punch, and not just because I wasn't paying on this occasion. It's a friendly and accessible little boozer trying to serve fresh, hearty food without any pretensions towards trendy fads or eye-watering central-London tourist prices. It deserves to do very well. A brave experiment here on Cheese and Biscuits today, as I attempt to write a post mainly about wine. Green and Blue is a wine shop and deli in East Dulwich, much loved in the local area (so I gather), who kindly invited a small group of bloggers and other interested parties in for a wine tasting to publicise the launch of their new Alsace range. With the wines came a selection of treats from the deli, forming a kind of mini tasting menu of four dishes and four different 100ml glasses of wine. I could instantly tell Green & Blue was a serious wine shop, because I recognised literally none of the bottles on offer. That's the kind of wine knowledge we're dealing with here, I'm afraid - if I see no Wolf Blass, Jacob's Creek or Hardy's then consider me impressed - but bear with me and I'll see if I can't muddle through. Kate Thal, owner, is frighteningly knowledgeable and clearly passionate about wine and first of all gave a quick background to the Alsace region and its wines. It's a funny old place by the sound of it - separatist, war-ravaged (in many different wars over many centuries) and with its own peculiar laws on labelling and bottling. Alsace, unlike anywhere else in France, is allowed to put its grape varieties on the bottle. This may seem like a minor point, but many people believe it's the fact that you can go out and buy an Aussie Chardonnay but have to memorise the producer and region of the tens of thousands of French wines that the New World varieties are today so popular. I'm sure the French have their own very good reasons for making deciphering their wine labels an intellectual pursuit in itself, but for the rest of us, it's just a bit alienating. The first wine was a 2007 Dirler Caude Muscat. Muscat, other than the sweet dessert types, goes with nothing, we were told. In Alsace most of this style of wine is drunk as an aperitif as it tends to clash with any accompanying savouries. Anything, that is, apart from artichokes - Kate believes that her roasted preserved artichoke hearts go perfectly (or at least very well) with this fragrant, fresh Muscat. And who am I to argue - all I can say for my part is that I slurped it all down quite happily. Next up was the 2007 Leon Boesch Riesling, accompanied by crab on toast. This is a far more traditional pairing, Riesling and seafood, and of course worked well. The wine was honeyed while at the same time being quite acidic and minerally - quite an interesting balance. I would have liked more white meat with the brown in the crab, but at this price point (£6.50) I suppose it makes sense to have a slightly more rustic mix. A buttery 2007 Leon Boesch Gewurtztraminer was served alongside a tasty Popina (you may have heard of these people - they have outlets around London) Aubergine Tart. There were some big Gewurtztraminer fans around the table who declared this course their favourite, and indeed it was hard to dislike this dense, rich wine. Finally arrived a 2006 Frederic Mochel Pinot Gris, alongside a plate of smoked chicken and red pepper. This was not a polite dish - the smoked flavour was overpowering at first and it definitely needed the sweet peppers to control it. But after the taste buds had a chance to become accustomed to the assault, it all worked out rather well. The Pinot Gris was acidic, to cut through the smoke and sweetness, and fruity enough to add its own layer of flavour. Each of these dishes and the accompanying wines can be bought for £6-7 each, or if you are hungry and thirsty the whole journey can be had for £25 - remember that's four small plates of food and the best part of 2/3 of a bottle of excellent wines. Bit of a bargain, if you ask me. Green and Blue is exactly the kind of friendly local wine bar that many other parts of London are crying out for - in fact they may have started a trend. Newly opened up the road from me in Battersea is Artisan and Vine, who appear to be trying very similar things. Watch this space. Lobster! One of my favourite things in the world and also something I never order in this country, for one reason only - the price. In the US and Canada these beauties can be picked up for $7 a pound, and even with the currency not what it used to be, that's still a bargain compared to the 1 1/2lb specimen I saw in Borough the other week on sale for £19. Sorry, I'd rather do without until my next stateside holiday. But Belgo, the mini chain of Belgian moules-frites restaurants, think they've cracked it - literally. 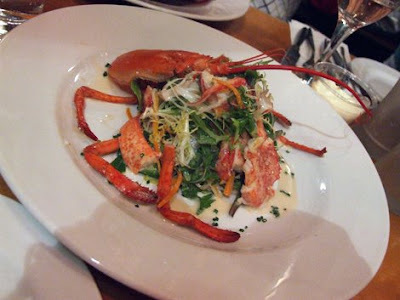 This month, until the end of the month, they are running a "Lobsterfest" menu, consisting of our favourite crustaceans served a modest amount of different ways, all for a VERY modest amount of money. And to get the 'fest off to a good start, they invited a modest number of food bloggers and press people to sample the new menu. Given that I was on a freebie, cost shouldn't have been a concern at all, but as I said, the sample menu we were shown confirmed the prices were indeed very low. Worryingly low in fact - £5 for a lobster bisque? £8.80 for half a lobster? Without wanting to seem ungrateful I did wonder what corners they must have been cutting to make a profit on serving what is usually a premium seafood. But when the food arrived, my fears were largely assuaged. The bisque was my favourite thing of all - rich and fishy and salty, and though it had probably been bulked out with fish stock was none the worse for it in this price bracket. The half lobster dishes, including a thermidore, a red Thai curry-spiced one and a salad, were perfectly decent for the price and at were presented well, legs and all. The lobsters, I'm assured, are flown in from Nova Scotia on a regular basis, never frozen and cooked to order from live. I would have liked to have the option of a boiled specimen - all the better for sucking the meat out of the legs - but really, given the scarcity of affordable lobster in London and the fact that Belgo is a smart, buzzy space with very capable service and is so massive you're more or less always guaranteed a table, to grumble about details seems pointless. So well done Belgo for bravely attempting to bring lovely lobster to the masses, and good luck with your future endeavours. When you feel ready to launch your £5 Iranian Caviar Credit Crunch Menu or a £8 Milk-fed Lozère Lamb Sunday Lunch, give me a call. I'm not a fan of many of the food shows on TV. This is largely because not many of them are really about food - Come Dine With Me, although wildly popular, is really just a reality TV concept where the eating is secondary to gimmicks, The Hairy Bakers is a show made purely because someone at the BBC likes the title, and Ready Steady Cook has Antony Worrall Thompson in it. But I have been hooked to the recent series of Great British Menu, a show where top chefs from all over the UK cook dishes loosely based on the theme of "A Taste of Home", competing for a chance to serve at a banquet laid on for returning servicemen and women from Afghanistan. There are plenty of things wrong with the show - the endless repeats and recaps, the pointless hyping of non-existent tensions in the kitchen, and of course Jennie "Bloody" Bond, but the food is stunning. Competing on behalf of the South East was Tristan Welch, who although impressing the judges with two of his dishes (An asparagus and egg starter, and a Mr. Whippy style ice cream dessert) failed to get anything on the banquet menu. But the British Army's loss is Kensington's gain, and I'm sure Tristan returned to his restaurant Launceston Place with his head held high. Sure enough, he was there to greet diners as they arrived to this spectacularly pretty part of London last night, and I'm sure his presence in the kitchen contributed to the very accomplished dinner I had. After a glass of superb house champagne (didn't quite catch the exact bottle but it was a Roederer) in the bar, accompanied by homemade chilli crisps fashioned into a bracelet and tied together with black ribbon (very smart), we were shown to our table. As with any good restaurant, there's nothing I wouldn't have eaten across any of the a la carte or set menus, but as I was in the mood for celebrating I went off-piste and ordered from the slightly more expensive a la carte rather than the £35 Toptable menu. First to arrive however was an amuse of warm cauliflower soup topped with truffle and crème fraîche. This was delicious. The crème fraîche floated over the warm soup so that when, as advised by the waiter, you sipped from the glass, the truffle aroma filled your nostrils as the cauliflower slipped down your throat with soothing intensity. Everything you'd want from an amuse, and although cauliflower soup as an amuse is hardly an earth-shattering revelation (see The Square, Andaman, Foliage, etc. ), when it's done as well as this you can't really complain. My starter was "Drunken quail flambé with hazelnut". The brandy-poached quail fillets were brought out to be shown to me before they returned to the kitchen for cooking. This was unnecessary and actually quite off-putting, as they were rather unattractive in this state - grey and swollen like pickled lambs tongues. When they returned, post-flambé and dressed, they looked better, but they really could have benefitted from a nice crispy skin instead of the wobbly grey membrane lurking beneath the jus. They were also quite bitter, possibly from some of the brandy not being burned off. The hazelnut foams and chunks were very tasty but it didn't really add up to a satisfying whole. A bit of a misfire this one, although I can see what they are trying to do. Better - in fact, significantly better - was my friend's ironic "Egg and cress sandwich", a near copy of the version Tristan did for GBM, which was as visually stunning as it was fresh and tasty. Lovely powerful asparagus, fresh and light mayonnaise and slow-cooked egg yolks, threaded with salty cured ham. Top stuff. My main course consisted of rose veal, sweetbreads, nettles(!) and pickled mushrooms. Again, clearly taking more than a nod from similar dishes I've eaten at The Square, it was none the worse for it, using gorgeous silky veal and nice enough sweetbreads flavoured I think with some sort of Indian spice - perhaps garam masala? The nettles were, perhaps fortunately, barely in evidence but the plate was shot through with delicate slices of melba toast. This was an exciting and robustly flavoured plate of food and I enjoyed it a great deal. The other main course was less successful. Tamworth suckling pig would have been more acceptable if they had simply chosen leaner cuts of meat. There was so much gloopy fat rolled inside these medallions of pork that eating them was a struggle, and with the fat removed there was very little left. The boiled radishes were lovely and scented and subtle, but really couldn't save it. Pre-dessert, and another slightly modified Great British Menu entry. Tristan has apparently kept the same instant ice-cream machine he used on the show and is still making the lovely Rhubarb and Crumble Mr. Whippy style ice creams, although these were served in plastic cones rather than the proper waffle cones. Still, they were very nice and came with a fruit liqueur to be sucked up using the straw. Oh and a great big lump of carved driftwood - always a treat. My dessert proper was a very light rhubarb cheesecake and a decent blob of fresh clotted cream (I think). Nice enough on its own but the highlight was an extraordinarily concentrated swoosh of strawberry jammy purée thing, scattered with toffee. My friend's dessert was even better - an impossibly light rice pudding soufflé, served with a perfect little jar of raspberry ice cream. Delicious. The cheese course (£8 supplement) was commendably 100% British Isles (that includes Ireland apparently). I tried a small selection of new cheeses, including a lovely soft pungent variety called Milleens from South West Ireland, and a gorgeous spongy sheep's milk cheese from East Sussex. It was no surprise to learn that both of these were unpasturised, and I shall keep my eyes open for them. So yes, there were mistakes and misfires but it is somehow these little slips that make the whole experience at Launceston Place all the more charming. A kitchen innovating and creating to such a high degree as here are bound to mess up occasionally, and how much better to be unpredictable and occasionally brilliant than reliably middle-of-the-road. Behind the rollercoaster of a ride that is having a meal at Launceston Place is a kitchen, and a head chef, cooking with intelligence and unbridled enthusiasm.